You may remember when I showed you a photo of my friend Camille's garden in February. 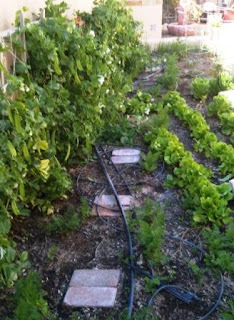 Now my friend Cathy's garden is overflowing with green & leafy produce, also! She has planted romaine and butter lettuce, snap peas, carrots, onions, and peppers- all colors - red yellow and green! I have had some of her snap peas and they were as sweet as dessert! Yummy!